Diagnostic Test Cartridge nie je ani tak hra, ako testovací cartridge pre systém Atari 7800, ktorý vyrobilo práve Atari, aby mohlo testovať ovládače a teda aj kvalitu obrazu a farieb. If you were looking for an official Atari manual then I’m afraid you are going to be disappointed. 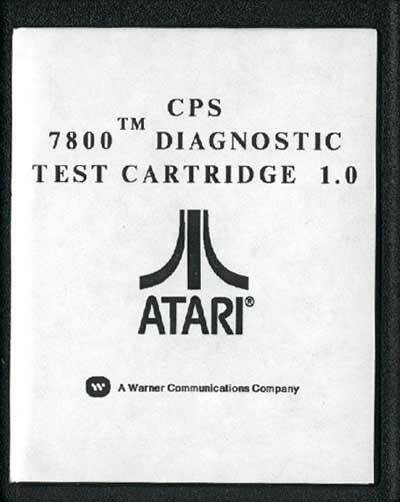 Atari never released the 7800 service manual that would have included the information about the Diagnostic Test Cartridge. With this page I am going to try and document some of the things that I have discovered about it. The main purpose of the Diagnostic Cartridge would seem to be the adjustment of the 7800 specific color pot. The other color pot and sundry other tests can be done with the 2600 Diagnostic Cartridge which are documented in the 2600 service manual. These tests done with the 2600 Diagnostic Cartridge can be used to test functions that are shared by both the 2600 and the 7800 systems. When you first insert the 7800 Diagnostic Cartridge into your 7800 you will get the standard Atari logo followed by a blank screen that lasts ten seconds while the Diagnostic Cartridge scans your system. If it encounters a problem it will display an error message(see error message section further down the page). If no error is encountered then the color adjustment screen appears. This is what you use to see if the color is properly adjusted. Notice the larger box in the lower right hand corner of the screen, if it is one solid color(a kind of yellow) then the color is properly adjusted. If you see two stripes of a different color through it then you will need to adjust it. To adjust the color, you will need to disassemble your 7800. (Note: If you disassemble your 7800, you do so at your own risk. The writer of this document will not be held responsible.) First, unplug your 7800 from the power cord and the TV. Then, remove the five screws that hold the 7800 case together. After you have it open, you will need to remove the top part of the metal shielding. Do this by twisting the metal tabs straight and then lifting the shielding up and off. After you remove the top shielding, the circuit board will be exposed. Look for the top color pot (closest to the cartridge connector) this is what will need to be adjusted. Plug your 7800 back into the TV and power, insert the Diagnostic Cartridge and turn on the power, when the color adjustment screen appears turn the color pot until the stripes disappear and the color in the box is solid. Your color is now properly adjusted. The 7800 Diagnostic Cartridge will only function on the NTSC version of the 7800 with the original „Encryption Code Checking“ OS. It will not work on an NTSC 7800 modified to use the „Asteroids“ OS. It will also not work on a PAL unit, with either OS installed. 14 – Incorrect OS installed. 06 – Generally appears if you hit a console button at the color adjustment screen, although more often the screen will go blank and the system will hang, if you press a button. 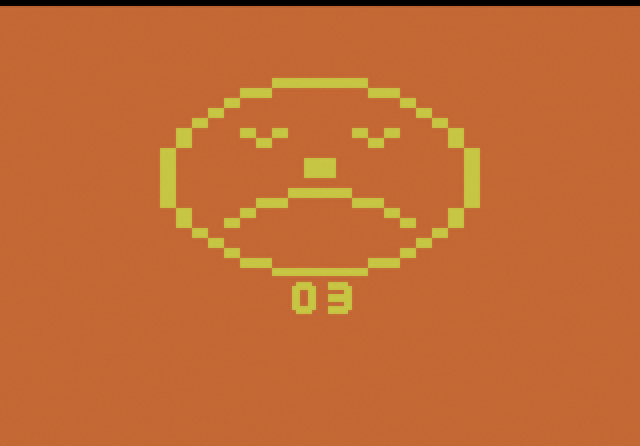 X4 – I got this error when I installed the standard NTSC OS in a PAL machine. I also got it once when I hit a console button at the color adjustment screen. 26 – I got this error once for no apparent reason. It should be noted that the controller ports are ignored by the Diagnostic Cartridge as well as the difficulty switches.